I started keeping this blog to give my family some idea of what my life is like, but now it looks like more people then just a few friends and my mom are reading, which is great! (Thanks Grace for the link!) And I bet people are wondering, why does this girl keep talking about goats? And where the hell is Belize anyways? Below is a bit of a sketch of my life, to catch everyone up. -I grew up in a small town in the States, but NOT on a farm. The last few years have been a bit of a crash course. -My senior year, I went on a medical mission trip to Ecuador. It was the first time I had ever seen extreme poverty close up…. and when I got back I knew things had changed, and I couldn’t keep living the same way. I decided to take a year after graduation and do mission work. - But Hey! It turns out it is really hard to find volunteer positions abroad in medicine (my preferred field) when you just have an undergrad bio degree. Luckily, my friend Alison also had a life changing mission trip experience and was headed to Belize… and asked me to think about coming along. 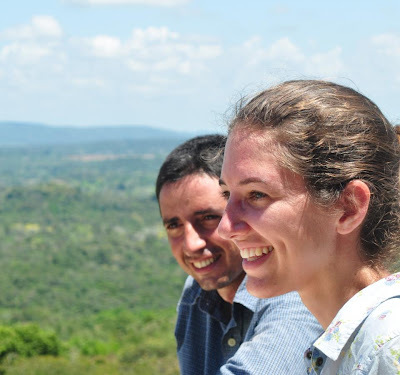 - Yeah, the Belize thing is a teaching position—like teaching actual high school students. I was not very interested, to put it mildly. But nothing else came through, so I decided to try one year. -I’ll give you a sec to google Belize. I didn’t know where it was either. I was told everyone spoke English, so I figured I was set! -Haha. My first semester was spent teaching 70 sophomore boys biology. Much craziness ensued… and then I decide to commit to a second teaching year. -Later that year, all the teachers in the entire country went on strike, and school was closed. Bored, a bunch of teachers and I start spending time at the farm of the agriculture teacher… named Daniel. -We start dating when I return for a second year. -I went back to the States for 2 years, and we dated long distance. Then we get engaged. -In one week, I graduated from my Physician Assistant program, move to Belize, and got married. That was quite a week. -We built a tiny, tiny house on Daniel’s family’s farm… and over the years have acquired cows, horses, chickens, guinea hens, rabbits, and an obnoxious amount of goats. Life here is very, very different. -And that brings us to now…. So any more questions? Leave a comment and say hi…. I’d love to know who is reading. And if I know you already, what's new? * I started a new blog which unfortunately has a very similar web address to another photography blog. Sigh. Anways, it's www.belizephotos.blogspot.com-- note the S or you will end up on someone else's site. Enough about that. The reason I started it is to force myself to learn more about photography. I love looking at pictures I take, but I'm not super enthusiastic about actually learning how to use my camera and editing software. Hopefully this new challenge will help Also, on this blog I tend to try and tell a story with my pictures. Often I have a single favorite picture (like above) that I never get around to working with, and maybe this will fix that. * I ran over a goat. WITH MY CAR. The goats love to mill about in the road, but they generally will slowly move out of the way of cars. Last week one decided not to bother, and since she was directly behind me I didn't even see her. I heard a loud, panicked goat scream, figured out what might have happened, and quickly stopped reversing. When I ran back to see what had happened, the now-quite-dusty-goat got up, shot me an evil look, and sauntered away. She is fine. * On the running-things-over topic, one evening I was driving towards home, and about 400 feet from my house a 4 foot long snake started crossing the driveway. I panicked, stopped, and then called Daniel and asked if I could run over the snake. He said, "....well, I guess so." (he doesn't share my ability to rise to instant panic level when confronted by a snake). The snake looked at me, I looked at the snake, and then I slammed down the gas. When I checked my rearview mirror, no flattened snake. Of course, then I started to really panic because what if the snake somehow flipped up into the under-workings of my car? I drove the rest of the way home, sat for 5 minutes to psych myself up, and then leaped from my car and ran to the house. Daniel says the snake just moved really fast and I missed it, which is an equally disturbing thought cause holy cow, how fast can a snake move?? I'm going to stop thinking about it now. 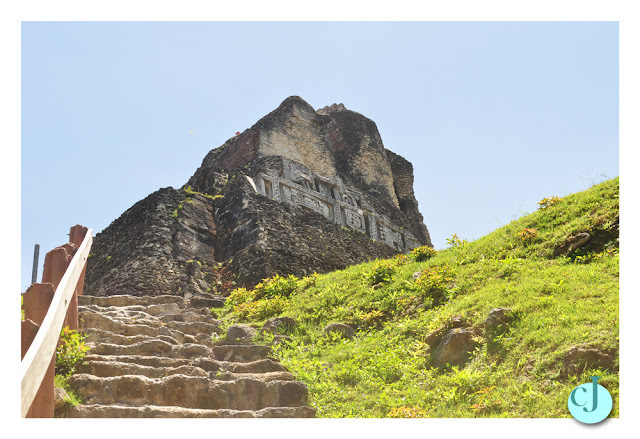 Anyways, one of the tours he does is a ride up to Xunantunich (the Mayan ruin near our farm). I asked if I could tag along one day, because taking a slow ride through the bush, across the ferry, and up the hill to Xunantunich seems like the perfect way to get there. The first part of the ride goes on paths through the farm, and then we rode a bit on the roadside till we reached the ferry. Then we lead our horses on the ferry and went across! Only in Belize. The ferry man knows Santiago, so he let us ahead of all the tourist vans and cars waiting. It was fun. Horseback really was the perfect way to go up the hill. Slow enough to look around, but not too much sweaty effort on my part.